Struggling to think of gift ideas? The Brookside Gift Card is the perfect solution. 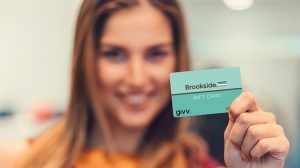 With over 100 stores, the Brookside Gift Card is incredibly easy to use and is accepted in any store throughout the centre where EFTPOS is available. To purchase a gift card visit the Customer Service Desk, located in front of OPSM Supermarket.